A comprehensive Emergency Medicine resource packed with useful information. Concise and to the point to help practising clinicians find what they need quickly. Ideal study guide for emergency medicine specialists in training. Don’t know your REBOA from your Ebola? Or your EXTEM from your FIBTEM? Do you think the M1 is a Freeway in Sydney? Can’t find apixaban or rivaroxaban in the index of your textbook? Know your TAPSE from your MAPSE? Tired of reading about the ‘state of the art’ from years ago? Then you need the Emergency Medicine Manual Online version. The Online version has significantly more content than the last print edition and is constantly updated. It is image rich and is significantly updated, on average, at least once a day. Now it is also customisable, so you can choose which content you want to see and what to hide. More than 2000 MCQs/EMQs, polls and other interactive features optimised for viewing on mobile devices of all sizes make the online version the most comprehensive and up to date Emergency Medicine resource available. With links to all the ACEM Fellowship curriculum procedures and skills required for the OSCE exam, it is an ideal resource for Fellowship examination preparation. With rapid search capabilities and extensive index and menu structure, it is also ideal rapid reference for the busy practising clinician. The 6th print edition of the manual was released February 13th 2015. The latest print edition was based on the most up to date version of the online version at of January 18th 2015. 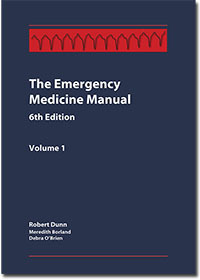 More than 4500 print copies of The Emergency Medicine Manual have been sold in 17 different countries. The 6th print edition went out of print at the end of November 2018, and is no longer available. If a new print edition is released, the earliest this would occur would be July 2019. The Emergency Medicine Manual provides the latest information about the practice of emergency medicine, with particular relevance to Australia and New Zealand. It covers all the major areas of acute care medicine as well as providing relevant information about chronic conditions that may influence acute care. Extensively used by ACEM specialists and trainees, the breadth of its content also makes it a valuable resource for general practitioners, international medical graduates, medical students, nurses who practice in critical care areas and paramedics. Information is presented in a ready reference format that enables the reader to find what they are looking for in the minimum amount of time. Although particularly relevant to practitioners in Australia and New Zealand, the manual is used in many other countries such as the UK, Ireland, Hong Kong, Canada, the U.S.A., Saudi Arabia and South Africa. Content mapped to ACEM curriculum descriptors or learning objectives – ideal for ACEM trainees.